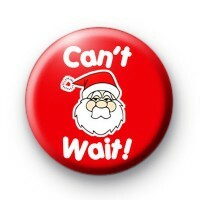 Bright red and white Christmas badge with a jolly Santa Claus face in the middle & the text 'Can't Wait' Are you or your kids excited for Christmas this year? Are they excited to open their presents from Father Christmas and get into the festive spirit? All our Festive badges are 1 inch in size and handmade in Cornwall. We have over 6000 Xmas designs to pick from and they make the perfect Stocking Filler.